Notify the squad! This one’s gonna be lit! 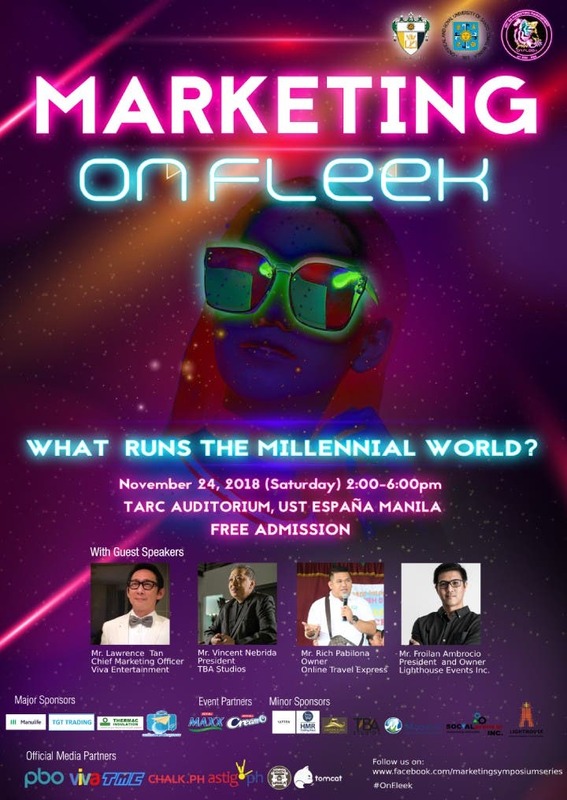 The UST-Graduate School Marketing Management class under Dr. Eduard Ong is inviting everyone to attend the symposium on Millennial Marketing entitled “Marketing on Fleek: What runs the Millennial World?” The event will be held on November 24, 2018, from 2:00 PM – 6:00 PM at the Thomas Aquinas Research Complex (TARC) Auditorium at UST España, Manila. It is open to the public and admission is FREE. First 250 online registrants will each receive a loot bag from the event organizers plus a chance to win exciting prizes during the event’s raffle. The symposium aims to impart relevant and up-to-date knowledge in crafting engaging and appealing marketing strategies and tactics for millennial consumers. Students and marketing professionals will gain valuable insights in marketing film, staging events and creating digital content for Millennials from invited guest speakers, Mr. Lawrence Tan from Viva Entertainment, Mr. Vincent Nebrida from TBA Studios, Mr. Froilan Ambrocio from Lighthouse Events Inc. and Mr. Rich Pabilona from Online Travel Express. The event organizers have also prepared exciting activities for the attendees such as games and raffles and will also be treated to special performances from surprise guests. For more information on this event, like them on Facebook at https://www.facebook.com/marketingsymposiumseries/. 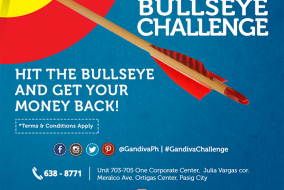 Gandiva Archery Bullseye Challenge: Hit the Bullseye and Get Your Money Back!